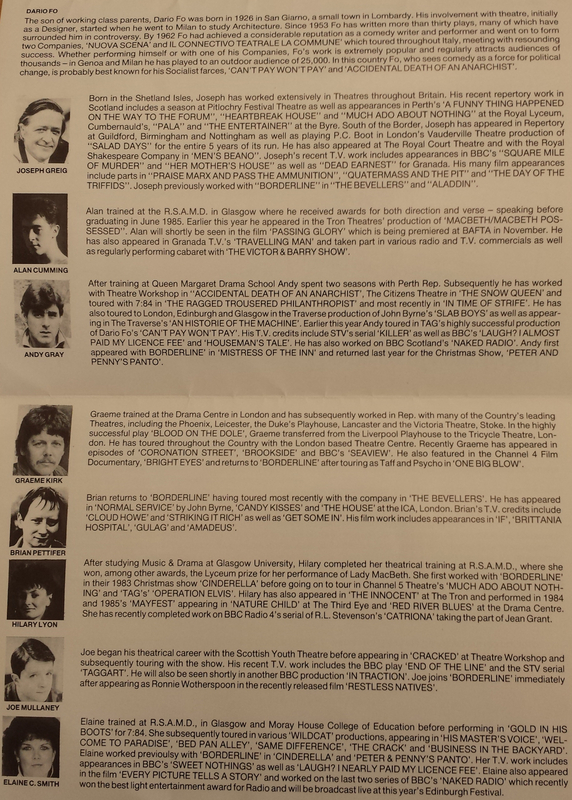 As soon as I left drama school in 1985 I started rehearsals for this Bordeline Theatre Company production of Dario Fo's play, Trumpets and Raspberries, which opened at the 1985 Edinburgh Festival fringe and then toured throughout Scotland. A few years later I would work on another Dario Fo piece at the National Theatre in London (Accidental Death of an Anarchist), and indeed work with the great man of political theatre himself. I played a variety of small parts in Trumpets and Raspberries. After Macbeth, Macbeth Possessed and Passing Glory, it was a little bit boring to be Medic #2 etc, but it was great fun. The two leading roles were played by Andy Gray and Elaine C.Smith. My then wife, Hilary Lyon, was also in the cast, so it was great to be able to be on tour with her.